2008-07-23 11:51 UTC Click images for enlargements. 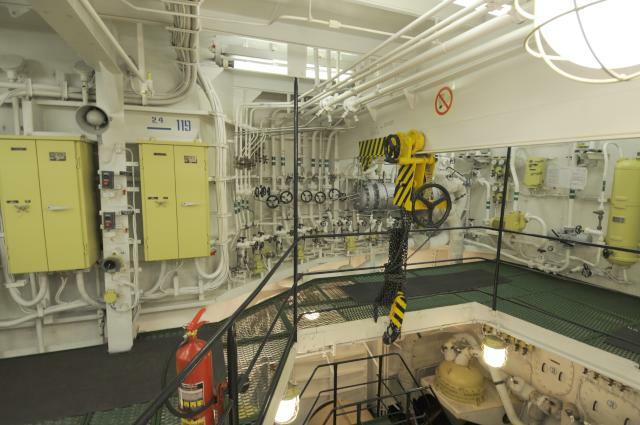 Throughout the voyage, groups of twenty passengers were granted escorted tours through the engineering facilities of the ship. Each tour began with an open-ended question and answer session with the chief engineer (in our group, at least, all questions were answered without any hesitation, including the enrichment of the uranium fuel, operating life of a fuel load, and temperature of the primary coolant loop), followed by a tour of the power plant and other engineering facilities. We were able to observe the reactor room through a lead-glass viewport from the deck above, and visit the high-tech (all flat screen) reactor control room, but photography was not permitted in these facilities. There were no such restrictions for the rest of the tour, although available light and confined quarters made getting sharp photos challenging. 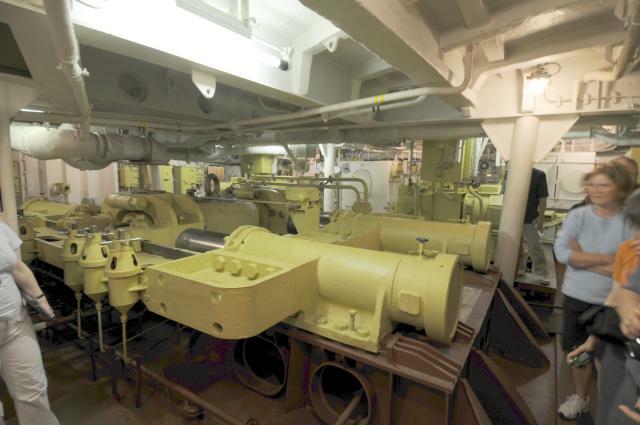 Above is the steering gear, with dual hydraulic cylinders operating the rudder. 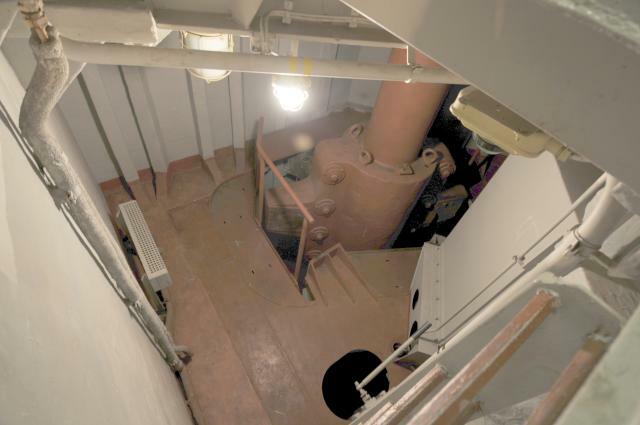 Here is a view of the shaft which moves the rudder. I'm sorry there's no handy scale reference here, but this thing is huge. 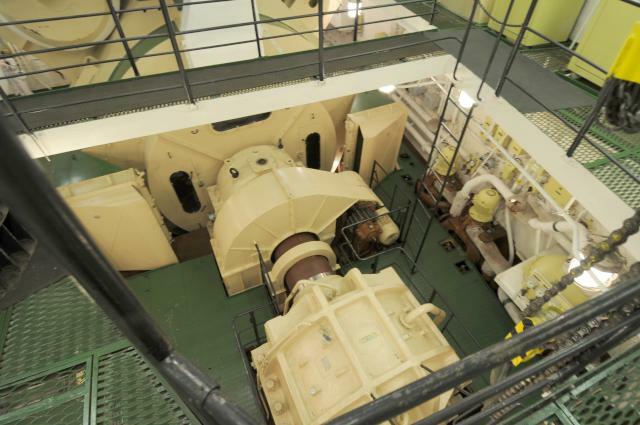 The heat produced by the nuclear reactors drives steam turbines which generate electricity to drive the triple screws. This is the motor and driveshaft for one of the screws. 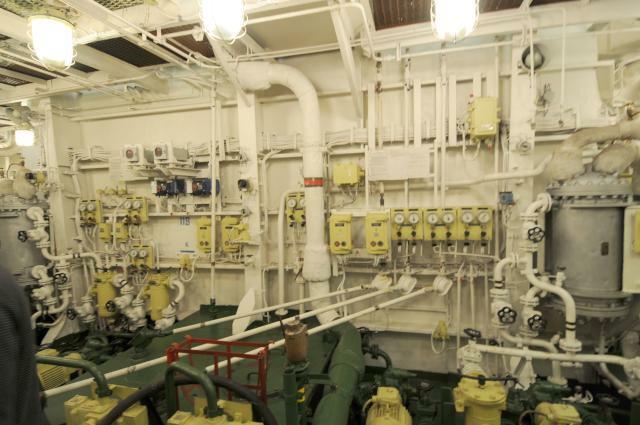 There are enough pipes, valves, and steam gauges here to make an engineer positively ecstatic! Here's another view of a primary driveshaft which may give a sense of how massive it is. 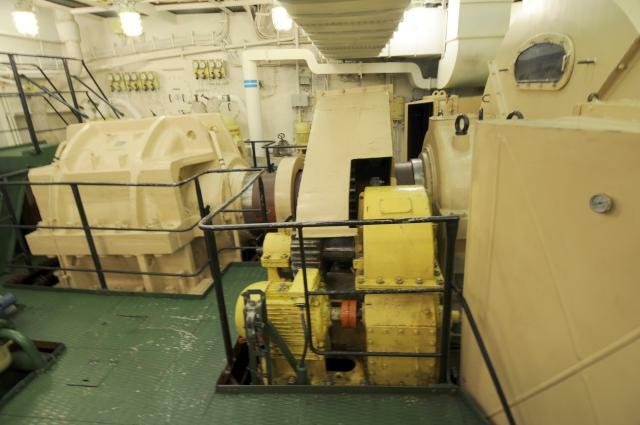 Nuclear, oil, or coal, ultimately marine propulsion is all about steam, and here's where the energy gets turned into propulsive power. 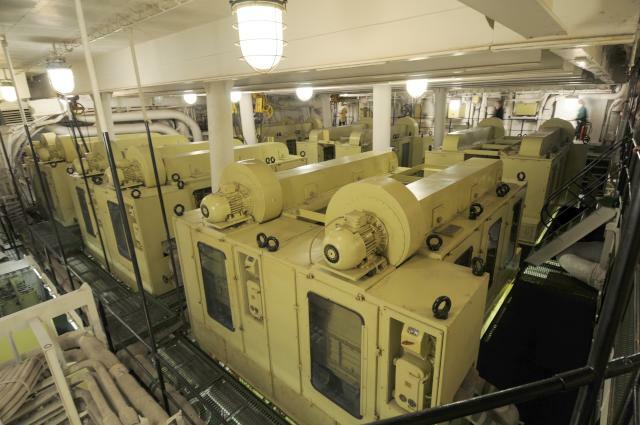 The black cylinders are the turbines which are driven from steam generated by the secondary coolant loop heated by the reactors. They, in turn, drive the electrical generators to the left, which we'll see below. 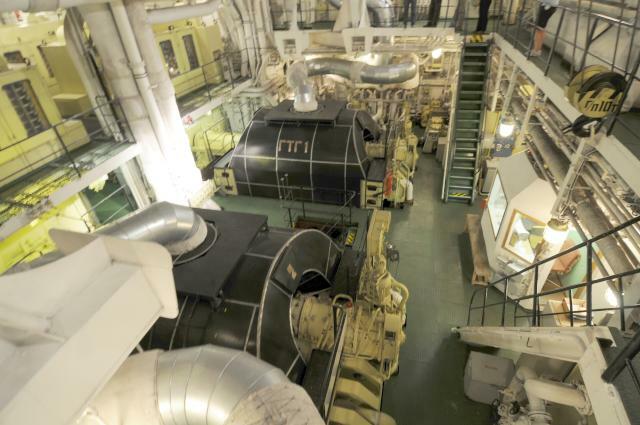 Nobody does dynamos better than Russians, and this massive generator complex provides the electrical power for propulsion as well as all of the other needs of the ship. Nuclear power changes the energy economics of sea travel. There's no need for “Navy showers” on a nuclear powered ship! The reactor generates such abundant thermal energy (compared with the propulsive energy ultimately delivered to the screws), that the engineering challenge is getting rid of the excess heat. In fact, Arktika class icebreakers are believed unable to traverse Equatorial waters due to the inability to reject waste heat in the warm seas there. 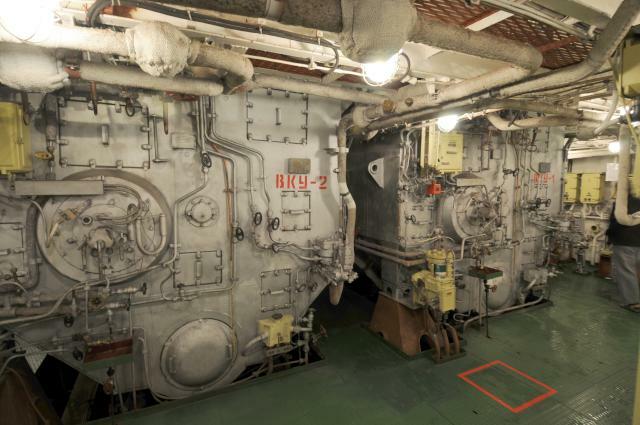 But when you have excess heat, there are many salutary things you can do with it, such as operating these desalinisation plants, which provide an essentially unlimited supply of fresh water for however long the ship should be at sea.